Lionel Duperron Drum Rudiment System (Beginner) DVD 1-2. Do you ever feel limited by your technical ability when playing the drums? Have you ever been frusterated when trying to learn a new beat or fill – wondering why it feels so un-natural to play a new pattern? If your answer is yes, the step-by-step video lessons included in the Drum Rudiment System were created specifically for you. 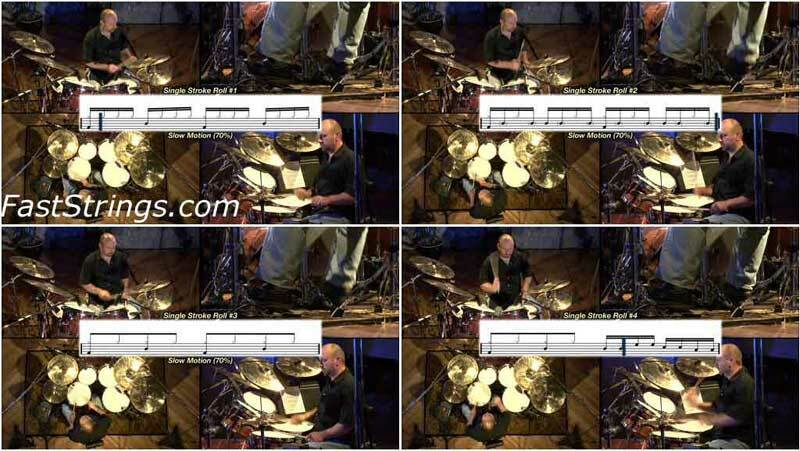 This section is designed to introduce you to the Drum Rudiment System, improve your hand technique, and introduce you to all forty drum rudiments. Lionel starts out by giving you special practice tips and tricks that will enable you to move through the contents of the training DVDs with greater ease. Then, he gives detailed information about stick grips to be sure you are playing with the best technique. Finally, he goes through the basics of all 40 rudiments. Each individual drum rudiment is first demonstrated on the practice pad. This is where Lionel explains each pattern in great detail, so you can understand exactly how to play the rudiments like they were meant to be played. Next, you get the opportunity to see the pattern played from three separate camera angles in slow motion. This helps you memorize the sound of the pattern, so it comes more naturally for you in practice. Finally, Lionel takes each rudiment to the drum set to demonstrate it on the snare drum, within two beginner drum beats, and within two beginner drum fills. All of these examples are demonstrated with four camera angles, sheet music on-screen, and at regular and slow-motion speeds. As a special bonus, Lionel has also included some excellent drum warm-ups, practice tips, and footage of some of his creative snare-drum solos at the end of the beginner module. In total, this section includes 5 hours of video content and 45+ pages of detailed training material in the spiral-bound workbook. muchas gracias amigos, es lastima que no esten disponilbes los links en otros servidores como mega… Pero muchísimas gracias de todos modos….